The first weekend in December was a busy and successful one on the roads for Quest Club. On a sunny and mild, but unseasonably warm Saturday morning, the women of Quest Club captured four age group awards at the 2nd Pacific Trail Iron Girl event. The 10 mile course consisted of two loops around Tempe Town Lake. Laura Clarke-Steffen led the way, in 4th place overall, and 1st in her age group. Helice Agria, Sue Shafer, and Mary Orr also picked up impressive age group award loot, which included color-coordinated Iron Girl sling bags and visors. Paula Case and Laurie Sommer also represented Quest Club in the 10 mile race. Sunday morning was also sunny, and about 10 degrees cooler than Saturday, nearly ideal for a long race. 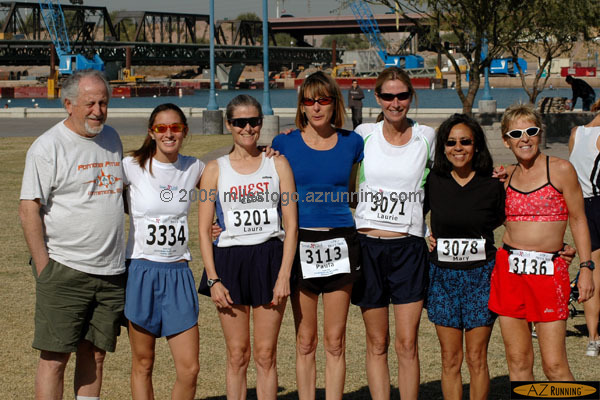 Quest Club was well-represented in the 18th Runner’s Den / Fiesta Bowl Half Marathon in downtown Scottsdale. Both Lyle Langlois and Kay Martin won their respective age groups, a mere 4 weeks after completing the ING NYC Marathon. Kay also set a new half marathon PR! 139 1:45:32 25/57 752 Van Newkirk, Scott 37 Phoenix, AZ Event P/R! 20 1:39:56 2/40 437 Lundgren, Suzanne 46 Phoenix, AZ Event P/R! 210 2:15:47 1/1 461 Martin, Kay 68 Phoenix, AZ Event P/R! This entry was posted on Monday, December 5th, 2005 at 12:11 am	and is filed under Quest Club. You can follow any responses to this entry through the RSS 2.0 feed. You can skip to the end and leave a response. Pinging is currently not allowed.